The AutoShakeout eliminates the need for shaking out or whipping the bar. The AutoShakeout will remove the bars from the bundle and place them on the entry conveyor. The operator simply lifts the end of the bars to be loaded onto the cradle preload mechanism. Those bars are stripped from the bundle and placed on the shearline entry conveyor. 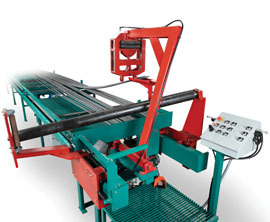 As the skewed roller strips the bars, a clamp holds the ends of the bars and swings over the conveyor. The entire operation is controlled from the preload operator's workstation. Reduce operator fatigue, reduce injuries, expensive insurance and Workers' Compensation claims. Increase your shop's throughput and increase your bottom line.